Why do I have to wear my retainer for so long? When braces are removed, teeth have a tendency to move to their original position. In the first month without your braces, the risk of relapse is high. Relapse means that anything that the braces corrected (spaces, crowding, crooked teeth etc.) can be undone if left unattended. Hence, retainers are made and placed the day after your braces have been removed. Retainers are custom made appliances used to keep your teeth in place after your braces have been removed. Here at Sable and Pepicelli Orthodontists, we use three types of retainers: Hawley, Essix and bonded retainers. Your orthodontist will determine which one or combination of these is best suited to your case. Hawley retainers have your classic ‘plate’ type appearance; they are constructed of rigid acrylic and very durable. Essix retainers are a clear plastic retainer, moulded to the shape of your teeth. 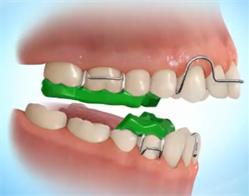 Bonded retainers are the ‘wires’ (actually a thin chain) that are glued to the inside of your teeth. Although some people think that the removal of braces means the conclusion of orthodontic treatment, this is incorrect. 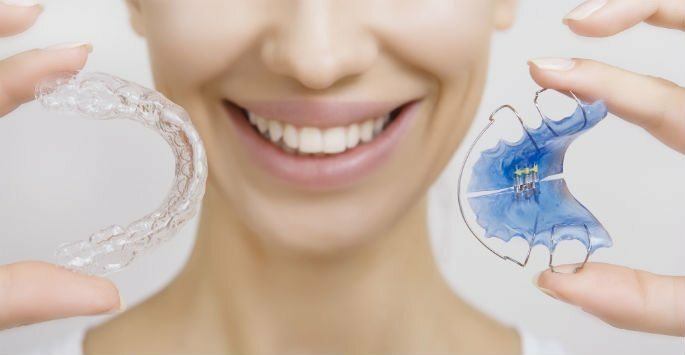 Retainers will be given to you after your braces are removed to ultimately retain the position of your teeth in the long term; keeping in mind that braces are only removed with the approval of the orthodontist when they are sure that the teeth are in the most ideal position possible. After braces are removed, the teeth need time to stabilise and to maintain their position in the mouth. Your orthodontist will see you every few months once you are in the retention phase of your treatment, and will determine how your retainers should be worn depending on the treatment provided. Retainers are used full-time for the first few months and then gradually reduced as the teeth start to stabilise. They will then be worn in bed at night time only, ideally for the rest of your life, to maintain your beautiful new smile! 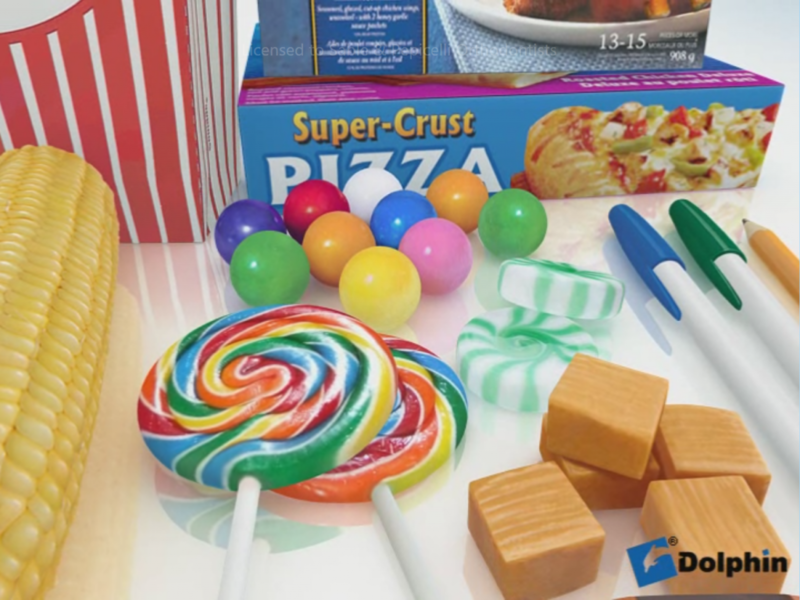 It is very important to keep away from certain foods during your orthodontic treatment. 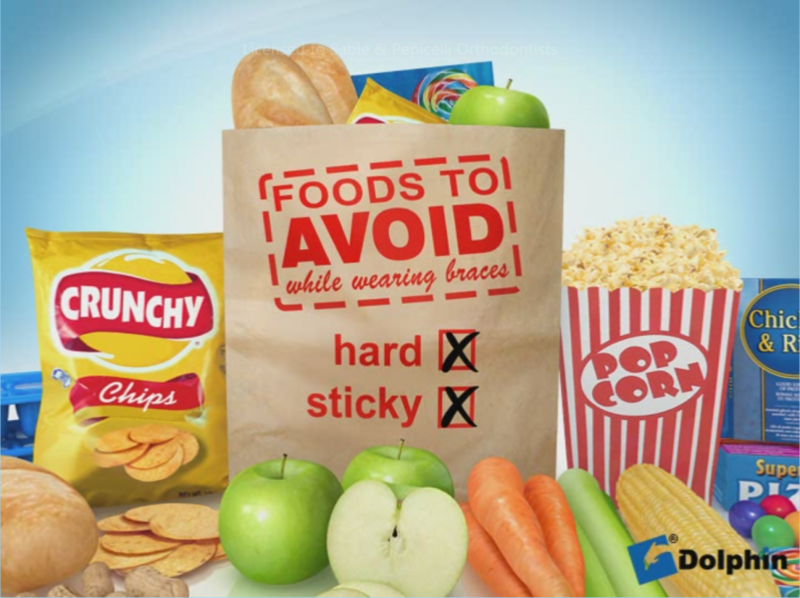 Eating anything hard, sticky or chewy can cause brackets to break, bands to loosen, bending/breaking of the arch wire and can even cause tooth decay. Foods high in sugar such as soft drink and lollies, cause bacteria in your mouth to start producing acids which can cause permanent stains, decay and damage to your teeth. If at any time you consume anything with high sugar content, make sure you drink and rinse thoroughly with water or simply brush your teeth immediately after. Picking at your braces with your fingers or biting on your fingernails is not a good idea. Also chewing on items such as pens or pencils can break brackets and bend wires, so avoid doing this. Any damage incurred to your braces can prolong your treatment time. The Twin Block appliance is a removable functional appliance used to treat patients with excessive protrusion of the upper front teeth. The name “Twin Block” is derived from the fact that the appliance is comprised of separate upper and lower plates with ramps (blocks) that work in tandem. The appliance is very effective when patients are entering their adolescent growth spurt and acts to posture the lower jaw forward to move the teeth into a more harmonious position. A Twin Block is considered more comfortable than some other fixed orthodontic orthopedic appliances. As the appliance is also removable, it is easier to maintain excellent oral hygiene during treatment. Appliances are generally removed when eating and playing sport. Speech can often be affected in the short term (they may experience a slight lisp) but like any other orthodontic appliance, patients will adjust after several days. The appliance is generally worn full time to achieve bite correction. Patients with a Twin Block appliance will see the orthodontist every 8-10 weeks to check progress and adjust the appliance as needed. Treatment time with Twin Blocks is usually 12-18 months, however this will depend on the age and growth pattern of the patient. Early treatment with a functional appliance will often be followed by comprehensive orthodontic treatment with appliances such as braces to achieve ideal alignment and complete bite correction. Why is oral hygiene so important with braces? Maintaining good oral hygiene is important for everyone, but when you are having orthodontic treatment, it is even more critical. Braces do not cause demineralisation, decay, gum disease or bad breath, but they can harbor food and plaque and make it harder to brush and floss. There are many types of bacteria that naturally exist in the mouth and in the food that we eat. Bacteria combines with proteins in saliva and creates a sticky film around the teeth and gum line called ‘plaque’, that subsequently allows more and more types of bacteria to attach. The bacteria have certain properties that allow them to produce acid, which can damage the tooth’s outer layer of enamel and underlying layer of dentine, as well as irritate the gums. If nothing disrupts the growth and reproduction of the bacteria (i.e. brushing and flossing), it can lead to a variety of issues including white spot lesions, tooth decay and gum disease. Over time, if the plaque is not removed, it can also harden into a calcified, grainy material called ‘calculus’ or ‘tartar’. It is then unable to be brushed or flossed away and will need to be removed by a dental professional. The formation of calculus can also prevent tooth movement. At Sable and Pepicelli Orthodontists we not only want to help you achieve the most beautiful smile possible, but we also care about the health and well-being of your teeth and gums! 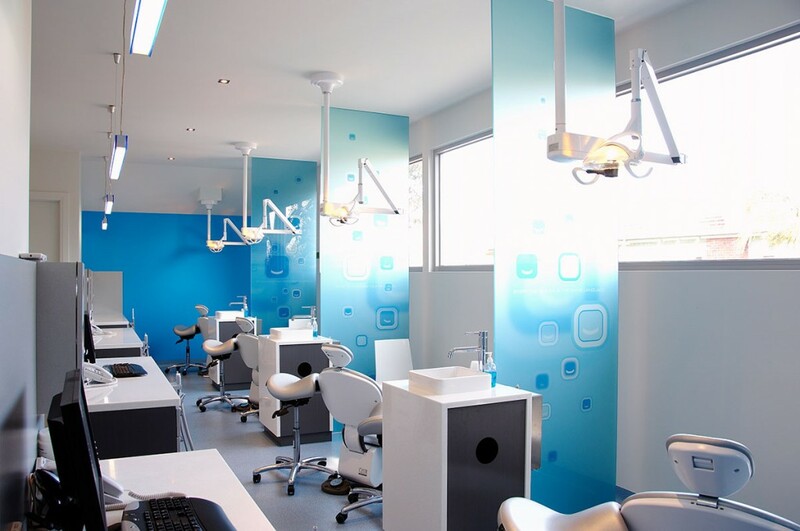 At the beginning of treatment, we will give you very precise instructions on how to maintain impeccable oral hygiene and we will monitor this at each appointment. It is extremely important to follow our advice to avoid increased treatment time, or even worse, having to take your braces off before treatment is complete! Can you spot the plaque? After braces are removed, orthodontists will issue retainers to hold and maintain teeth in their final positions. It is important to wear your retainers to avoid tooth movement. Retainers are worn inside the mouth and sit against the teeth. If retainers are not cared for and cleaned well, they can harbor bacteria, plaque and create an unpleasant odor. Therefore, it is really important to keep your retainers clean. Take your retainers out when you eat. Brush with a toothbrush without toothpaste and rinse under cold water at least once a day. Retainers are generally made out of plastic or acrylic. 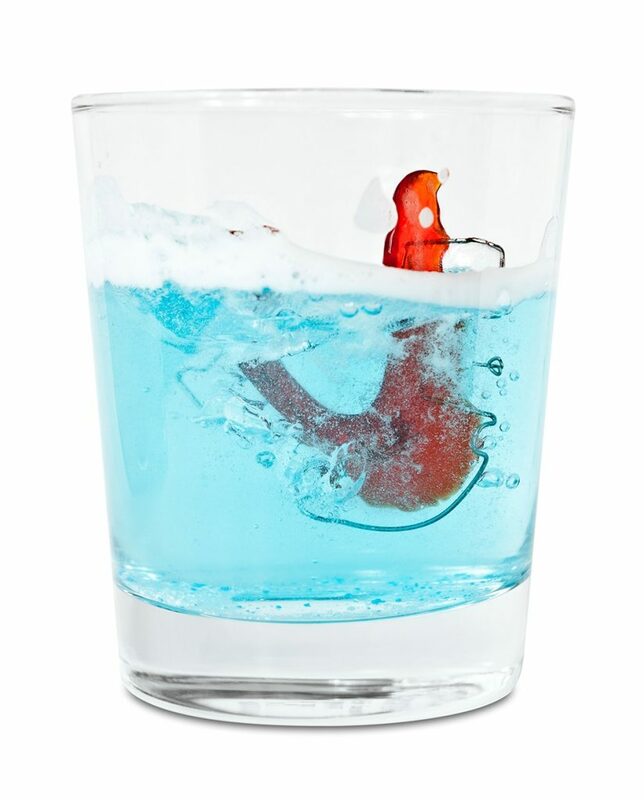 Hot water may distort the shape of retainers. For a further clean, you can soak retainers with a Steradent tablet and water mixture once to twice a week. Alternatively, you can mix 1 part white vinegar with 2 parts cold water and soak for around 30 minutes. Retainers are removable and they are easy to misplace. They are also costly to replace! Therefore if the retainers are not in your mouth, they need to be kept in a case. Do not wrap them up in a tissue, place them in your pocket, or leave them lying around. Keep retainers away from pets as they like to chew them. Do not play with retainers, or flip them in and out. Always remember to bring your retainers to every appointment. How long have you been working at Sable and Pepicelli Orthodontists? What is your role at Sable and Pepicelli Orthodontists? Yes, for 2 years in year 8, but i didn’t wear my retainers and some of my teeth relapsed. Always wear your retainers!! I grew up in country Victoria in a town called Warragul. I then moved to the city when I turned 18 to go to university. Chinese. I was born in Shanghai and moved to Australia with my parents when I was two years old. Yes, Mandarin and Shanghainese. My Shanghainese is probably better because that’s what i speak with my parents. What is the most rewarding part about your new job here at Sable and Pepicelli Orthodontists? 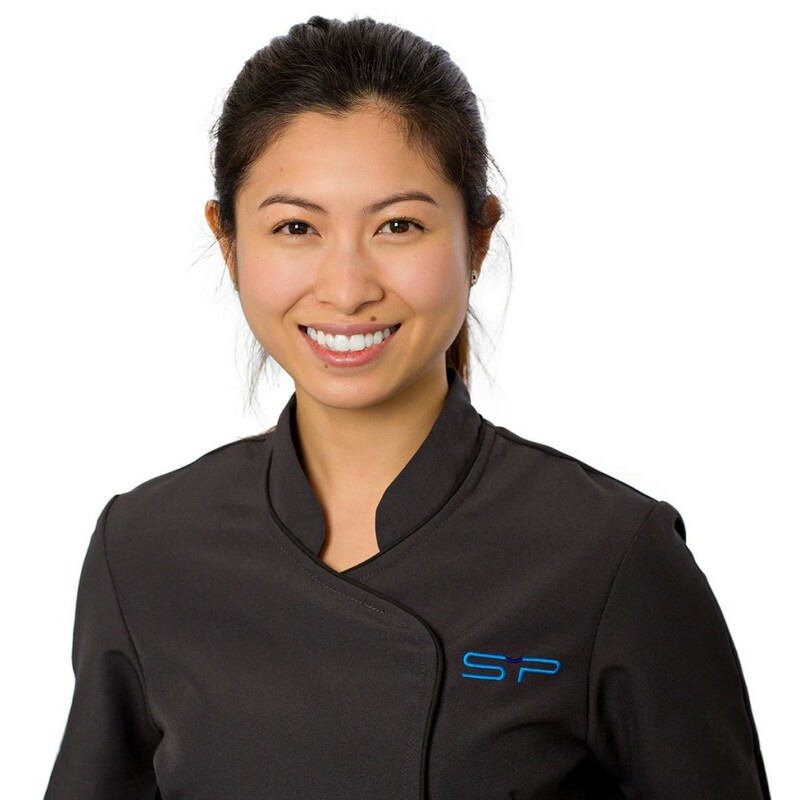 I really enjoy being part of a passionate, caring team that helps create beautiful smiles that patients are proud of. I especially love seeing the before and after photos. So far … Japan! For the food and shopping. The Culture is also incredible. Graphic design, brunching, reading, and playing badminton. Sushi Hotaru, Bourke St, Melbourne. They have the best soft shell crab hand rolls ever!! I also love Humble Ray’s for brunch, everything on their menu is delicious. If you’ve just had your braces placed and things are a bit sensitive at the moment, give this YUMMY braces friendly recipe a go- we think it sounds delish! Step 1- Preheat oven to 200C/180C fan forced. Cook the risoni in a large saucepan of salted boiling water for 8 minutes. Drain. Step 2- Meanwhile, heat 1 tbs of the oil in a large non-stick frying pan over medium-low heat. Add the onion. Cook, stirring, for 4 minutes or until softened. Stir in the garlic for 1 minute until aromatic. Transfer to a bowl. Heat half the butter and half the remaining oil in the pan over high heat. Add half the mushrooms. Season. Cook, stirring, for 3 minutes or until browned. Transfer to a bowl. Repeat with the remaining oil, butter and mushrooms. Step 3- Return the onion and mushroom mixtures to pan. Add the cream and rind. Simmer for 2 minutes. 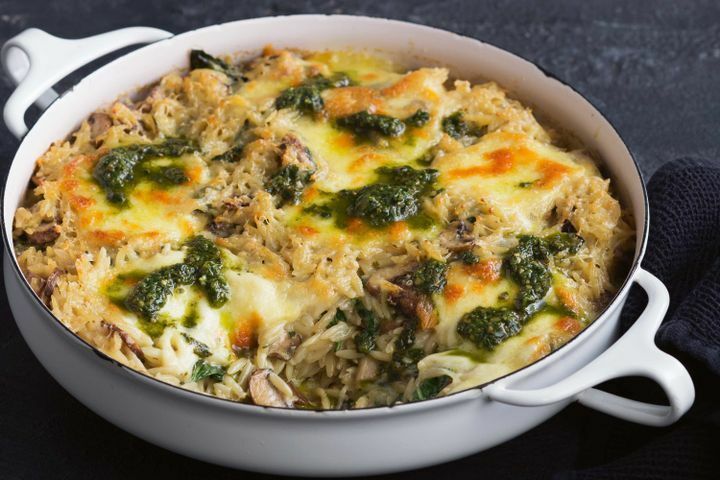 Add the risoni, spinach, 1⁄3 cup pecorino and 1 tbs of the pesto. Season. Remove from heat. Sprinkle with remaining pecorino. Top with mozzarella. Bake for 15 minutes or until cheese melts. A common misunderstanding is that orthodontic treatment can only commence when all adult teeth have erupted. Early treatment is sometimes required before this, and is aimed at treating functional issues with developing bites and occasionally for psycho-social reasons (e.g. teasing at school due to the appearance of the child’s teeth). Your dentist is usually the first person to detect such problems and may recommend an early referral to an orthodontist for your child to undergo an assessment. Usually early treatment occurs any time after eruption of the front adult teeth and first adult molars (from age 6 onward) up until eruption of the adult teeth (approximately age 12). It is uncommon for treatment to be required earlier than this. 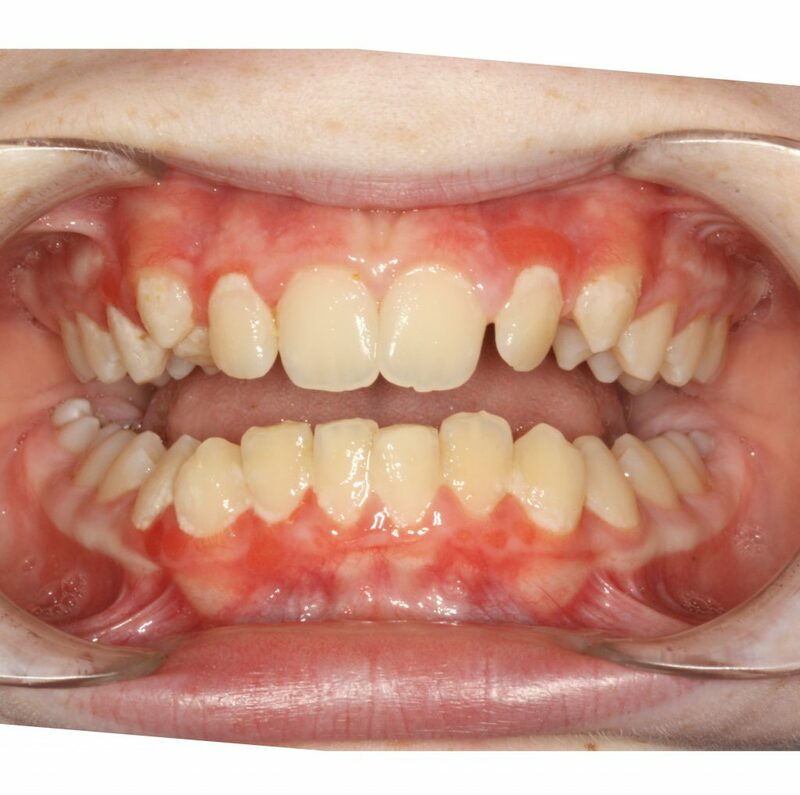 Protrusive upper front teeth: If the upper teeth stick out over the lower teeth to a significant degree, they are more susceptible to trauma. This is particularly so if a patient cannot close their lips over their front teeth or for children engaging in contact sports. Deep bite: Upper teeth cover the lower teeth more than they should, which can cause increased wear to the enamel of the front teeth and sometimes damage to upper gum tissue. Under bite: Lower teeth are forward of the upper teeth. This may be the result of a jaw growth discrepancy and/or tooth problem. 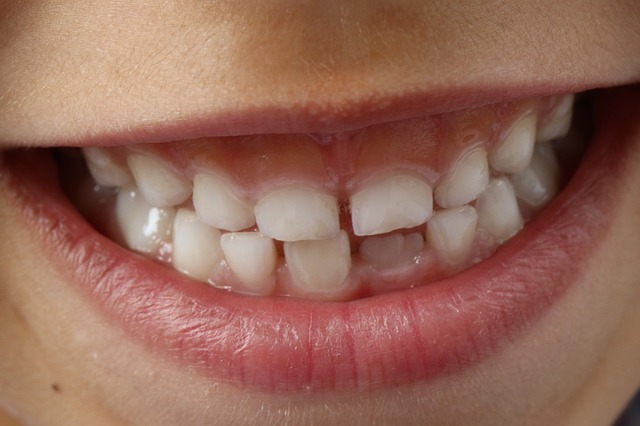 Open bite: Upper and lower front teeth do not come together. This is often the result of a finger/thumb sucking habit. Crowding: Jaws are too narrow or teeth are too large causing crowded or misaligned teeth. Spacing: Teeth are too small or jaws are too large causing space between the teeth. Sometimes teeth also fail to develop which can lead to increased spacing of the teeth. Space maintenance: If a baby molar tooth is lost early (e.g. due to decay), it is often necessary to hold the space with a space maintainer for the developing adult tooth to erupt into the arch. Crossbite: Upper teeth are inside the lower teeth, causing wear to the teeth and possible asymmetrical growth of the lower jaw. 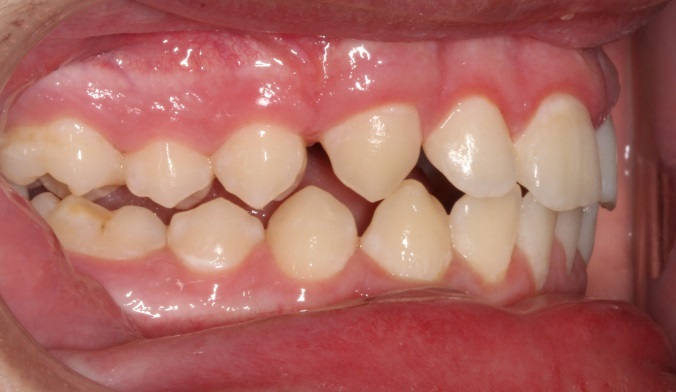 Malpositioned teeth: Teeth erupting into the wrong position can sometimes cause damage to adjacent teeth as they erupt. 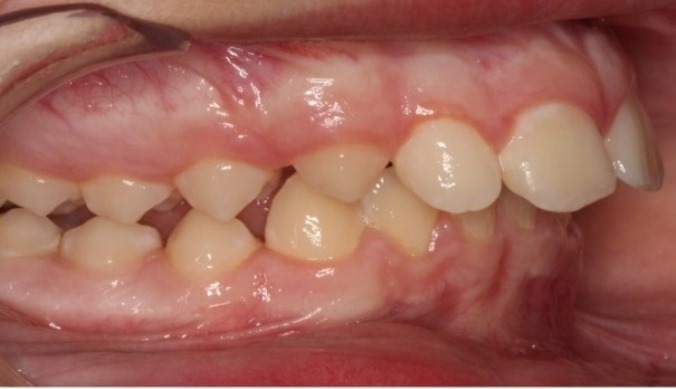 It is important to detect this problem early to facilitate treatment to allow for normal dental development. Impacted teeth/delayed eruption: If teeth have not erupted at the usual age or there is a significant delay between corresponding teeth erupting on different sides of the mouth, investigation is required. Teeth can sometimes become ‘stuck’, which is often the result of an extra tooth growing, previous trauma to the baby teeth affecting root development, or incorrect position. If you have concerns that your child may have any of the above issues, it is recommended to speak with your dentist or arrange for a consultation with your local orthodontist. They can then determine if early treatment is required or whether treatment can wait until the child is in the adult dentition. Orthodontists have traditionally placed braces on the teeth one at a time, in a process known as direct bonding. Although this technique is widely practised, a more efficient and comfortable method, known as indirect bonding, is often used at Sable and Pepicelli Orthodontists. In order to place the braces indirectly, our orthodontic therapist will start by taking impressions of your upper and lower teeth. From these impressions, our laboratory technician creates a set of plaster models. Your orthodontist will then carefully and accurately position the braces on the models, without you even being in the clinic! 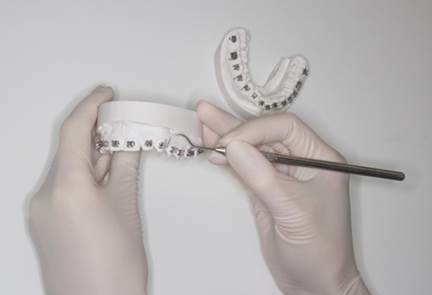 Once the braces are in place, soft custom trays are placed over the models which allow the braces to then come away from the plaster, within the trays. On the day that you have your braces fitted (usually one to two weeks after the impressions), our orthodontic therapist will clean and prepare your teeth. Once the teeth are ready, the orthodontist will fit the custom trays containing all of the braces, and then set the glue. After the glue is set, the custom trays will be removed, and your braces will be on! Lastly, you will have your upper and lower wires inserted, and then you will be ready to begin your orthodontic journey! We often have parents ask us “what age should I bring my child in to be seen by the orthodontist – they’re only 8, is that too young?”. Quite the contrary – around 8 years old is the ideal age to first see us. By that age, some of the permanent/adult teeth are beginning to erupt and it is possible to identify unfavourable growth patterns (e.g. crossbites, deep bites etc. ), address bad habits (e.g. thumb sucking) or assist front teeth in erupting correctly. Moreover, it provides a good reference point to allow the orthodontist to monitor growth and dental development over time. Often your orthodontist may be able to simply review your child on a regular basis, with the view to treat them when all of their permanent teeth are through. Conversely, early intervention is sometimes required to correct dental problems. Early treatment may not necessarily prevent the need for comprehensive treatment in the future, however, it may simplify later treatment or decrease the length of time spent in care. Additionally, it may help to avoid premature damage or wear to teeth that have erupted unfavourably.